Tumor Blueprints provide a detailed profile of a tumor’s molecular characteristics. By measuring an evidence-based collection of biomarkers, this important diagnostic tests for molecular changes in more than 300 genes and the levels of around 10 proteins. These results can inform treatment choices, pointing to therapies that may have the best chances for success. A Tumor Blueprint can be informative for women who are newly diagnosed and have a negative germline BRCA test of their blood. A BRCA mutation can sometimes be detected in the tumor but not the blood (called “somatic”) and this testing can determine if the tumor is positive. Patients who are BRCA positive in their blood or tumor may benefit from a PARP inhibitor as maintenance therapy after first line. For women with recurrent or refractory ovarian cancer, a Tumor Blueprint can provide important new information to help guide their next treatment. 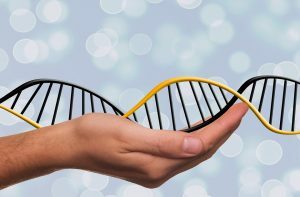 In some cases, these genomic changes may qualify a patient for a clinical trial because they are predicted to make the tumor more sensitive to that investigational therapy. These tests and their interpretation do not stand still. Clearity scientists regularly survey the medical literature to incorporate the latest information about biomarkers and treatments into the Tumor Blueprint report and add new tests or biomarkers to the diagnostic testing panel. The Clearity Foundation currently collaborates with two CLIA-certified clinical labs to perform the testing: NeoGenomics Laboratories and Foundation Medicine. Typically, these diagnostics take two to three weeks to process. Clearity summarizes the results from each laboratory into one report, which is sent to patients and their physicians. This comprehensive report is available online and provides information about the drugs that match the tumor profile and the reasons they match – all accessible by a mouse click. This evidence comes from clinical research studies that have shown a correlation between protein levels or genetic changes and drug effectiveness. As part of this analysis, Clearity compares each patient’s results to those of other ovarian cancer patients in the Clearity database. In addition to their Tumor Blueprint reports, patients have access to Clearity’s staff, who have expertise in ovarian cancer molecular and cellular biology. These important consults help them understand their results and the unique nature of their cancer, as well as potential treatments and clinical trial options. Clearity does not provide medical advice about which treatments they should receive. Instead, our staff explain Tumor Blueprint results and provide potential questions, and other information, which patients can discuss with their physicians. Talk to your doctor about Clearity’s Tumor Blueprint and refer them to the For Physicians section of this website. Download and submit these forms and records to Clearity Foundation. Please be sure to discuss profiling with your physician prior to submitting your forms as his or her authorization is required. The Clearity team will work closely with you and your physician to have a tumor sample from a recent biopsy or surgery sent to our clinical laboratories for testing. Clearity’s scientific team will summarize and analyze the laboratory results to create a report describing your tumor’s molecular profile, as well as treatments that may prove helpful. Some of those treatments may be available in clinical trials. The cost of the biomarker and genomic testing can vary depending on your insurance. We are committed to helping women make more informed treatment decisions, regardless of their ability to pay. Please do not hesitate to fill out our financial assistance form. Please email Clearity at patientsupport@clearityfoundation.org with completed forms and requested records or fax to 858-657-0265. These documents will help Clearity ensure you receive the testing results as rapidly as possible. This video shows a sample Tumor Blueprint report and offers tips on how to access the information and use it to make important decisions about your care.